MediCupping Therapy targets difficult to treat, chronic muscle adhesions (also known as: "knots"). These are hard, bumpy, concentrated areas of tight tissue that are bunched together. The entangled tissue clusters become hypoxic, or oxygen deprived. These knots are commonly found on many areas of the body, especially the back and neck. They consist of abnormally dense muscle fibers or fascia, and they are sometimes referred to as scar tissue. An adhesion is often caused by acute injury, trauma, or repetitive-motion contraction of muscle tissue. It can also be caused by constant tension on the muscles over an extended period of time. 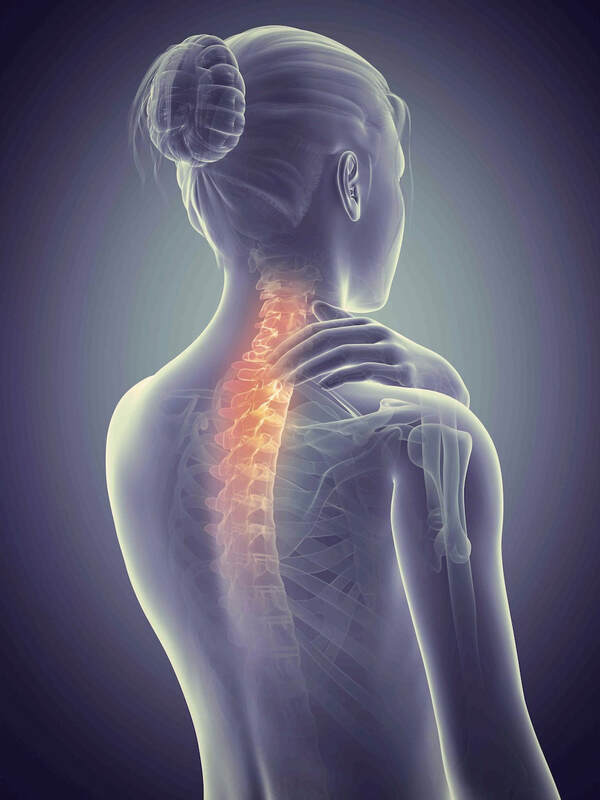 Although a person may not think they have sustained a particular injury, this condition can actually be caused by everyday activities, stress and overwork, or poor posture. For example, working at a computer all day long in the same position can have this effect. Or there may be a more obvious injury or strain that occurred. Whatever the cause, the fibers cluster together to form a knot. Why are Soft Tissue Adhesions a Problem? Muscles function optimally when they have proper blood circulation and nourishment. But when soft tissue adheres together and circulation is restricted, it can eventually result in dysfunction. This dysfunction creates more load for other surrounding structures which have to compensate for the restriction. When damage is continually induced in an area, the tissues cannot heal and remodel properly. Over time, knots can turn into myofascial trigger points that refer pain to other areas. The adhesion then becomes a source of chronic pain, weakness, nerve impingement, and limited range of motion in the body. Left untreated, it can potentially lead to more advanced issues or injuries. This is because other muscles have to work harder to take up the slack, and more load is transferred to the joints and bones. Many people come to a massage complaining about these "knots" and seeking relief. Cross-fiber friction massage strokes can be used in an effort to break down the tissue in a way that will allow for more normal healing. And a certain amount of progress can be made from massage therapy. However, if the knots are old and chronically neglected, this progress can seem very slow and results are often temporary. After a massage, the adhesions may quickly revert back to their usual problematic state. If you have chronic knots that never seem to go away, then the addition of MediCupping to your Massage may be a good option for you. How Does Massage Cupping Work? ​MediCupping is a powerful tool that can help make real progress with problematic adhesions. It may provide faster results and longer lasting relief compared to using massage alone. When MediCupping is combined with cross-fiber friction strokes in massage therapy, results are greatly magnified. The MediCupping technique utilizes cups similar to what is employed in Acupuncture Cupping practice. However, Medicupping is aided by vacuum suction, and the cups never remain static on the body. In other words, they are constantly in motion over the skin gliding freely with the aid of massage oil. The suction action causes the cups to pull upwards on the underlying tissue, creating a "separation effect" in the layers of fascia and soft tissue. This can be thought of like a "reverse massage." Instead of pushing downwards with compression on the tissue, MediCupping pulls the tissue in the opposite direction. This unique type of force enables renewed blood flow and oxygen to reach very hypoxic areas of dehydrated tissue. And it effectively aids in the elimination of old waste and congestion. MediCupping has an impressive softening effect on stubborn, difficult to treat adhesions. Is MediCupping Right for You? You should not receive MediCupping Therapy if: You are pregnant, taking blood thinners, have any type of bleeding disorder, have blot clots, varicose veins, pacemaker or similar device, broken bones, dislocations, ruptured disks, sunburn, skin disorders, hernia, severe edema, cardiac or renal failure, ascites, purpura, fever, leukemia, or you are a cancer patient undergoing radiation. ​MediCupping Therapy is comfortable to receive. If it does become painful in any way, your therapist can lower the intensity to a more comfortable range. MediCupping can also leave temporary red or dark red marks and patterns on the skin. These can look surprisingly dramatic at times. But because the cups are constantly in motion, the resulting marks are usually not as dark as those left by Acupuncture cups. Some of the marks may even appear to look like bruises. These marks are caused by the pulling action of the cups which draws blood circulation and waste to the surface of the skin. All of the marks and patterns disappear completely within a few days, or up to 2 weeks. In other words, your skin returns to normal. This effect is something you should expect to experience to from MediCupping. It will occur at different degrees of intensity depending on the condition of your adhesion, and the location and focus of the treatment. Self-care at home will make the marks dissipate even faster. If you are highly concerned or anxious about the marks, or you have any of the contraindications listed above, MediCupping may not be an appropriate therapy for you. For maxium results, MediCupping Therapy is given within a regular 90 Minute Massage. During your session, it may require at least 30 minutes or more to apply the MediCupping techniques to your problem areas. The remaining time is devoted to detailed, therapeutic massage. Your massage can be either full body, or focused entirely on upper-body. Angela Bothwell utilizes hands-on, cross-fiber friction massage strokes along with Medicupping to maximize treatment for adhesions. Additionally, she applies Ashiatsu Massage with her feet on larger muscle groups in order to achieve a broad-pressure, Myofascial Release effect on the tissues. You should be comfortable with the idea of all these modalities being used within your session. Angela is a bodywork artist who needs access to all her "tools" in order to provide you with the absolute best treatment she has to offer. If Traditional Massage is strictly your preference, and you don't want to experience Ashiatsu, Angela is happy to refer you to Shawna Timmerman.